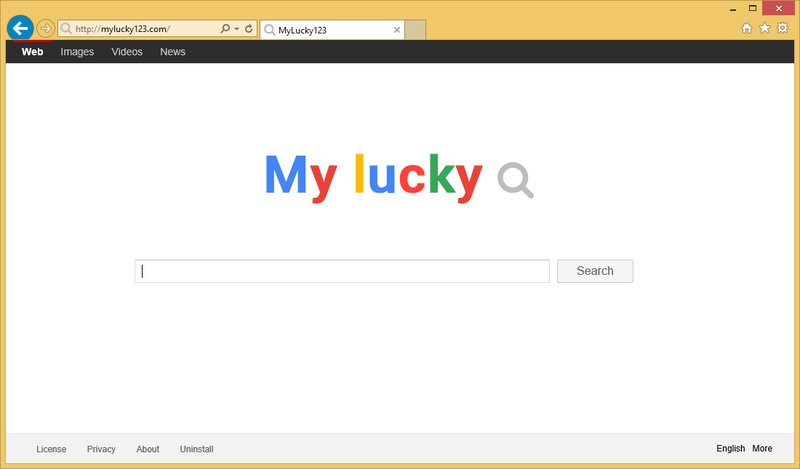 Mylucky123.com is a browser hijacker that alters your browser settings upon arrival. Its main goal is to generate web traffic and it uses various tactics in order to do so. It not only replaces your home page and default search provider, but it also inserts adverts into your visited sites, causes redirects to unknown domains, and so on. By boosting web traffic, the developers of the software make profit. As the hijacker affects all most commonly used web browsers, you will not be able to avoid its symptoms. We urge you to waste no time and get rid of Mylucky123.com without hesitation. The distribution method used by Mylucky123.com is called bundling. It gets installed onto computers through downloaders that are employed on third party software hosting pages. When you install freeware from these sites, you are usually offered to install additional programs. These programs are often ad-supported. It is possible to avoid them by choosing the Advanced or Custom mode and declining all offers of unfamiliar apps. We advise that you do that the next time you install free software. Once inside, the hijacker alters your web browser settings. It replaces your home page and default search engine with Mylucky123.com. This site looks somewhat similar to Google.com. Its search box shows you customized Google Search results. This means that Google results are modified to include sponsored links that come from the hijacker. The hijacker will insert advertising data into other pages that you visit as well. It may also cause redirects to its associated sites in the middle of your browsing. You should keep in mind that the commercial content shown to you is not monitored by anyone, so it may be unreliable. That is why we urge you to be careful with it. If you wish to improve your cyber security level by eliminating the unsafe data from your browsers, you will have to terminate Mylucky123.com. There are two available Mylucky123.com removal options: manual and automatic. We advise that you go with the second one, because it is more effective and beneficial. In order to erase Mylucky123.com automatically, you will need to implement a reputable malware removal tool. You can acquire the software from our page. It will perform a system scan and detect all unwanted components. The utility will then eliminate Mylucky123.com along with other potential threats. In addition to that, it will also help you keep your computer protected from similar and more serious Internet-based infections in the future by shielding your PC at all times. The alternative solution is to delete Mylucky123.com manually. You can do that by uninstalling its related program from your system and fixing your web browsers. These tasks may seem somewhat complicated for inexperienced computer users, which is why we have prepared a detailed manual Mylucky123.com removal guide below the article.